This is the heart of winter in Maine, short days when we typically have plentiful snow and our coldest temperatures. The garden has been under snow cover for the past two months, and garden perennials are dormant. This is the season for my indoor garden of potted flowering plants, and the divas of this winter garden are the flowering amaryllis bulbs (Hippeastrum). I brought my dozen or so pots of amaryllis up out of their enforced period of dormancy in the basement about six weeks ago, set them in the sun, and began to give them regular water. But the conditions in my Maine house are cooler than these tropical plants prefer, which makes them slow to bloom. It’s always a waiting game to see whether I will get flowers on the indoor bulbs before the crocus flowers come up through the snow and bloom outside. A few days ago, I spotted the first flower bud on an amaryllis bulb. I believe this one is ‘Apple Blossom,’ and it should begin to flower before the end of February. 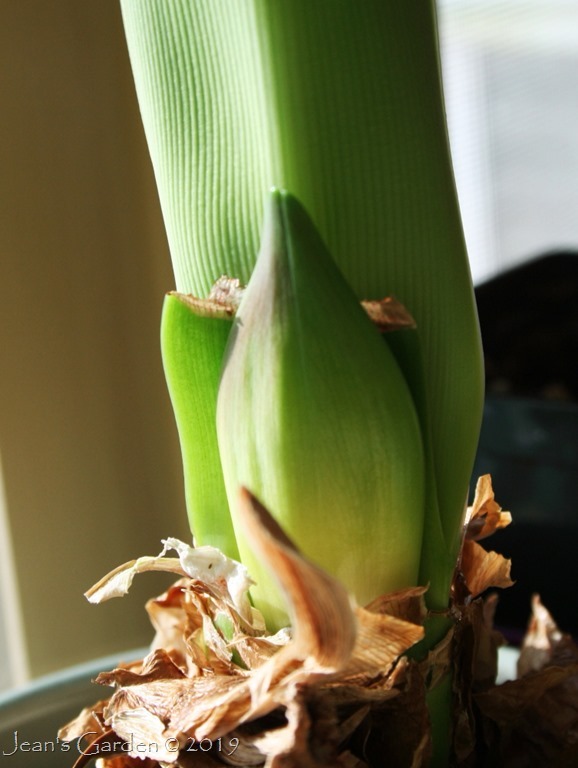 Three other potted amaryllis bulbs have not yet put out any new foliage, and this delay is often a precursor to making a flower. 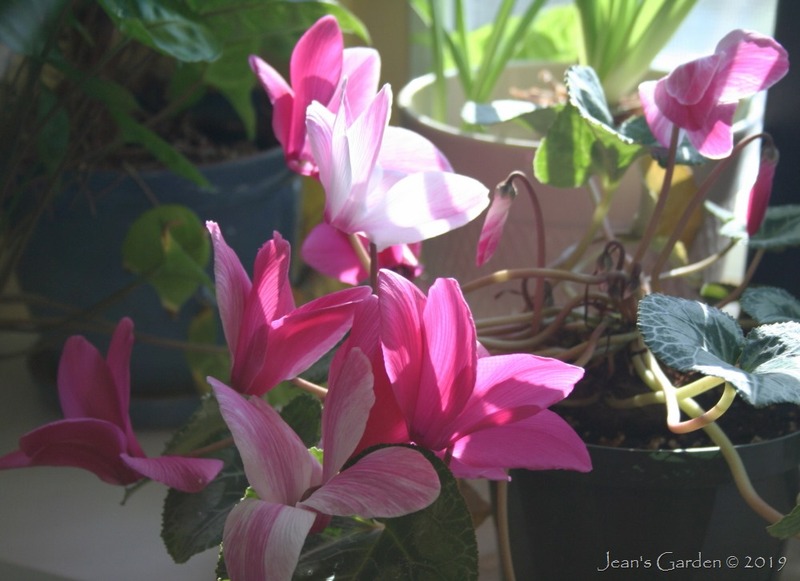 Meanwhile, my potted Cyclamen persica – which love a cool, bright spot – are happily blooming. I never get tired of seeing their colorful flowers backlit by the sun. I also love the way that this one, which had white flowers brushed with lavender when I bought it last year, has produced flowers in three different shades and patterns this year. Garden Bloggers’ Bloom Day is hosted on the 15th of each month (although some of us are habitually late) by Carol at May Dreams Gardens. Visit her blog to see other gardeners’ January blooms. Thanks, Ellen. One of the benefits of a cool house in a cool climate is being able to keep cyclamen happy and blooming for much of the year. Very nice Jean. I took a break from Amaryllis this year to challenge myself with an Orchid. First time so anything can happen growing one. Good luck with your orchid, Gary. I am a serial orchid killer. They definitely are not happy in my cool winter house with its dry air. I’m glad to see you found some blooms – and pending blooms – to celebrate, Jean. I planted my butterfly amaryllis in the ground after they flowered last year in the hope that they’ll naturalize but the jury is still out on the success of that effort. It worked in my former garden just 15 miles away but it’s hotter and drier here. Kris, It would be lovely to have amaryllis growing and blooming in the ground. I bought a Papillo Butterfly variety a number of years ago. I understood it to be a relatively easy one to grow; but mine bloomed the first year I had it and then promptly made an offset. I repotted the two bulbs and keep them going from year to year, but neither has ever bloomed again. 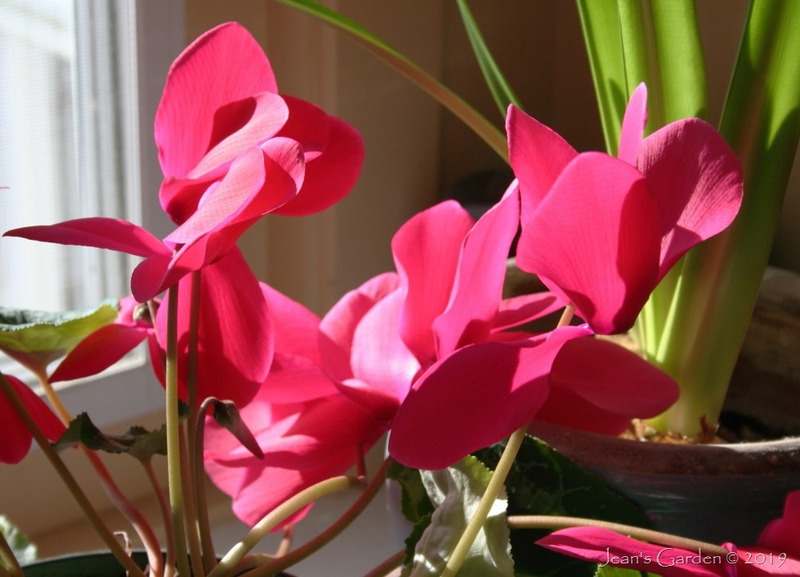 Your Cyclamen are a beautiful treat for winter weary eyes! A few years ago I discovered that Amaryllis will grow outside in my garden. My favorite is Appleblossom, which was a gift from one of my sons. Every year it grows larger and produces more blooms. Deb, Apple Blossom is a favorite of mine, too. I currently have two bulbs of this variety with buds on them, so I should get weeks of Apple Blossom loveliness when they bloom. Hello Jean, I think we used to have Amaryllis “Apple Blossom” years ago, but we never got it to re-flower so have given up on them. I can’t wait to see yours in flower. Your cyclamen are stunning and it’s reminded me to try and get to the bottom of the garden to see how ours are doing, especially during this cold (for the UK) period that we’re having. I hope your new set of cyclamen last a long time too! Sunil, ‘Apple Blossom’ has been one of the easier bulbs for me to get blooms from. Right now, of my twelve potted amaryllis bulbs, three have flower buds growing — and two of those are ‘Apple Blossom.’ I have two more that I have hopes for this year. If I got flowers on five different bulbs in the same season, that would be a new record for me.